The prank video is all about to promote the remake film called 'Carrie,' from Stephen King's 1974 novel. Carrie is a high school girl who had telekinetic powers. 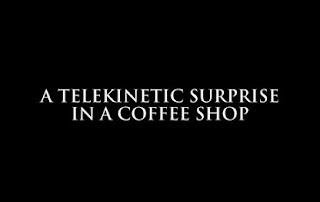 The telekinetic prank was happened inside the coffee shop in New York. And the prank video goes viral in just 24 hours upon uploading in Youtube last Monday, October 7, 2013. Please watch the video below and see how they made the prank smooth and real. As the video description stated, "hidden camera experiment captures the reactions of unsuspecting customers at a New York City coffee shop as they witness a telekinetic event." For the meantime, please bookmark this page now or visit this site more often for you to be updated. You may also share this post to your friends so they may know about the Carrie prank video. Comments or suggestions about "Carrie prank video inside coffee shop in New York goes viral " is important to us, you may share it by using the comment box below.